The Monster’s worldwide success and well-earned image as the unchallenged icon of naked motorcycles is the result of investing over 20 years of Ducati engineering, design and styling experience. It is an investment in time, constantly rewarded by being the motorcycle of choice for motorcycle connoisseurs and celebrities, from actors and musicians to Formula 1 drivers and top athletes. The Monster has always been a statement on two wheels, an expression that created a cult following and, above all, a premium lifestyle motorcycle easily accessible to everyone. The new Monster 1200 and Monster 1200 S present the next generation of this famous family, combining genuine Monster tradition with Ducati’s latest technical solutions to engineer a modern and mature masterpiece. From the super-smooth refinement of the second generation Testastretta 11° DS engine and its Panigale-style direct attachment to the frame, to stunning and industry benchmark TFT instrumentation and best-ever ergonomics, this iconic motorcycle now mixes authentic sport character with lifestyle sophistication. The new Monster’s larger fuel tank presents an even more muscular image, emphasised by a narrow waistline and an incredibly compact headlamp that creates the overall silhouette of a powerful bull ready to charge. The clean and minimal handlebar area continues the naked icon’s essential character, while attention to detail like the tinted, transparent master cylinder reservoirs add a distinct quality to component finish. The new Monster returns to its outrageous roots with the Desmo, liquid-cooled, 4-valves-per-cylinder, 1198cc Testastretta 11° DS motor. Underlining its naked motorcycle passion with the mantra: “it’s all about the engine”, the new generation models present the most usable, excitement-fuelled power ever delivered by a Monster. The second generation Testastretta 11° Dual Spark engine, which now becomes a fully-stressed chassis member with Panigale-style attachment points for the Trellis frame, uses a number of important and highly effective features to deliver 135hp @ 8,750rpm and for the Monster 1200 S, an extra 10hp to 145hp @ 8,750rpm. With precise attention to the mapping of the large capacity Desmo engine, Ducati have dialled-in an impressive torque curve to further enhance riding pleasure, generating a peak torque of 87lb-ft (12kgm) for the Monster 1200 and 92lb-ft (12.7kgm) for the 1200 S version, both values @ 7,250rpm. The impressive 50-52mm (1.96-2.04in) section exhaust headers lead the 2-1-2 system through power-enhancing equal lengths that help enable the Monster’s efficient power delivery. The engine management system dedicates a lambda probe to each header, providing precise fueling via a large airbox, while the stylish cannon-style, vertically stacked silencers carry catalytic converters to provide Euro 3 conformity and electronically controlled mid-section valve to optimise exhaust pressures throughout the rev-range. The Monster 1200’s Testastretta 11° DS engine reaches another milestone in Ducati’s constant investment in quality by enabling the distance between major service intervals (valve clearance check) to be set at an owner-friendly 30,000 kilometres (18,000 miles). While maintaining the vitally important aspects of the original Monster concept, the new generation chassis introduces Ducati’s very latest design techniques. The model’s signature Trellis frame still features predominantly in the overall styling, while its attachment points move directly to the new engine’s cylinder heads, a method pioneered on the innovative Panigale Superbike. This new and compact frame design combined with its large diameter steel tubing has effectively doubled its torsional stiffness compared to previous models. Considerable attention has been applied to the ergonomics of the new model with a stability-enhancing 60mm longer wheelbase ideal for two-up riding comfort, and handlebars a ride-transforming 40mm higher and 40mm closer to the rider. The brand new seat design with high-grip surface, further enhanced with red stitching on the S model, boasts a comfortable 80mm of foam at its deepest point and presents Ducati’s first-ever adjustable seat height system with innovative simplicity. Using a simple block-and-pin system, the seat is able to be transformed from its standard 810mm seat height to a confidence-inspiring 785mm and even further to 745mm with the accessory low seat — Ducati’s lowest ever. This easy adjustment without changing the overall aesthetic profile of the Monster introduces true ergonomic flexibility to this impressive sports-lifestyle motorcycle. Perfectly formed grab-rails provide a confidence-enhancing grip for the passenger without compromising the lines of the Monster’s beautifully styled tailpiece. A sleek and sporty single seat cover comes as standard equipment, giving the rear-end a clean and sharp look, further minimalised by a Diavel-style registration plate holder. While enhancing the presence of the new Monster with a more muscular silhouette, the new style 17.5l (4.6 US gal) steel fuel tank is carefully shaped to fit the rider perfectly. The new Monster rolls on Panigale-style 10-spoke light alloy wheels with rim sizes of 3.50 x 17 for the front and 6.00 x 17 on the rear, while the Monster S sports a new style triple Y-shape spoke design with extra machining. Both models use Pirelli Diablo Rosso II tyres in 120/70 for the front and impressive 190/55 for the rear, constructed in bi-Compound to combine long lasting mileage with excellent full-lean grip. The high quality tyres use Pirelli’s Enhanced Patch Technology (EPT) to optimise contact patch for improved grip and Functional Groove Design (FGD) to enhance their wet weather characteristics. 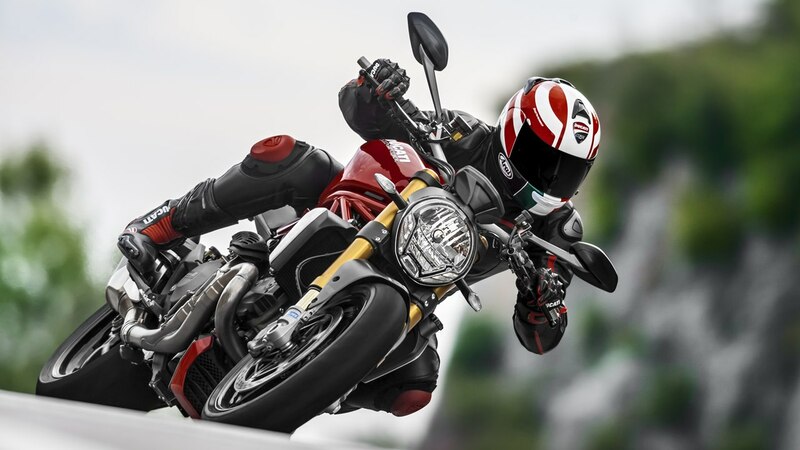 The new Monster 1200 and Monster 1200 S both use Ducati’s Riding Mode technology to incorporate three-level ABS and eight-level DTC into the Ducati Safety Pack (DSP) concept, further underlining the company’s increased focus on performance safety. Included as an integral part of the Ducati Safety Pack (DSP), both the Monster and Monster S are equipped with the Bosch ABS 9MP controlled Brembo braking system as standard equipment, an impressive combination of state-of-the-art security and proven performance. The Monster’s super compact headlamp assembly uses conventional halogen main light illumination with LED position lights on either side and full LED lighting for the beautifully shaped rear and brake light illumination. The S version of the Monster 1200 extends LED* technology to the directional indicators which also sport a hazard light function, activated by holding the left-turn signal button on for four seconds. The Ride-by-Wire (RbW) system is an electronic interface between the twistgrip and the engine which decides the ideal power response depending on the Riding Mode selected and according to the rider’s throttle input. The twistgrip no longer uses a throttle cable to control the throttle body butterflies, but instead Ducati’s “e-Grip” delivers a signal to a control unit, which in turn operates the butterfly opening. The RbW system enables the use of three different mappings to regulate the power delivery. The three maps offer 135hp (145hp for the S Model) with a “High” sports-type delivery, 135hp (145hp for the S Model) with a “Medium” progressive delivery suitable for touring and 100hp with a “Low” reduced delivery for urban use. The new Monster and Monster S use Ducati’s industry-leading Thin Film Transistor (TFT) technology to present a stunning instrumentation display, which combines exceptional user-freindliness with state-of-the-art information delivery. The system serves the rider with full environment integration by changing both its background image and display layout according the Riding Mode selected. The fully customisable display is programmed with three different backgrounds for Urban, Touring and Sport Riding Modes and three different layouts entitled “Core”, “Full” and “Track”, each designed to display information appropriate to each of the three Riding Mode environments. In Touring Riding Mode the display completely changes to “Full” layout, changing the background graphic, delivering the maximum amount of information required during a long journey, reducing the size of the speed numerals and replacing the data previously displayed at the top of the screen with a 1,000-11,000 graphic rev-counter. The incremental bars of rpm are animated to adjust the orange and red coloured sections of the rev-range subject to running-in and engine warm-up periods and increase numeral size as each value is reached. With the selected Riding Mode now shown to the left of the speed the entire lower part of the display from left to right is dedicated to time, engine temperature and DTC and ABS levels and on the bottom left of the screen by default the odometer and on the right the average fuel consumption. Both left and right lower data read-outs are scrollable using the buttons positioned above and below the indicator button on the left-hand switchgear to display trip A, trip B, trip fuel reserve, trip time and lap times (if activated) on the left and actual fuel consumption, average speed and air temperature on the right. In Sport Riding Mode the display adopts the “Track” layout, changing the background to a brushed aluminium finish and presenting road sport-essential information only. The rev-counter graphic recalibrates itself in a scale that curves through 90° around the left and upper edge of the main screen in Superbike style, with speed prominently displayed in the centre of the screen and ABS engine temperature and DTC displayed across the bottom from left to right. Positioned bottom centre is the odometer read-out by default, scrollable using the buttons positioned above and below the indicator button on the left-hand switchgear to display trip A, trip B, trip fuel reserve, time, trip time and lap times (if activated) average fuel consumption, actual fuel consumption, average speed, engine temperature and air temperature. All three display layouts feature a setting memory whereby, information scrolled-and-selected other than default setting is memorised by the system and re-displayed upon the model’s next ignition-on.